For the past year or so I've been toying with the idea of buying a pair of raw denim jeans to break in. For a long while I didn't wear jeans very often, but lately, I've been living in them. I just haven't been able to find the perfect pair and it seems that a pair broken in by your own daily wearing would by definition, have to be the perfect pair. I've done a bit of online searching and unfortunately, most of the information about raw denim is directly at guys. Apparently it's sort of a guy thing. Who knew? I did find one helpful post here which gave me a few ideas of where to start. I'm leaning towards a pair of A.P.C. jeans. But they have so many fits, I'm not sure which one would be right for me. 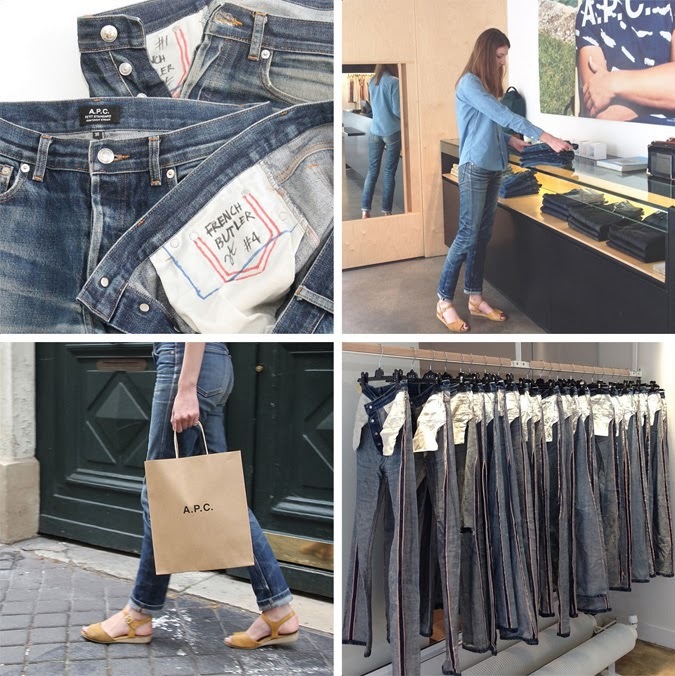 So... the next time we're in NYC I'll definitely be stopping in the A.P.C. store to try on as many pairs as it takes until I find the right ones. I'm also curious about Raleigh Denim since they have jeans cut for women, but their raw denim is not 100% cotton and I'm not sure how that affects the "breaking in" process. Any ladies out there have any experience with raw denim? Please keep us posted on your discoveries. I'm so sick of 73% Cotton, 25% Polyester, 2% Spandex! I saw this roundup recently which has me curious too: http://denimhunters.com/2013/10/womens-raw-denim-roundup/ Sometimes Emerson Fry has them too. i have a pair of nudie jeans. cut in the "high kai" style. they're marketed as mens jeans, but this cut is unisex. i wear them almost everyday! Ok so... not on the subject of raw denim BUT, you should also check out Courtshop while you're in NYC. I bought a pair of hi skinny jeans from them (which have 2% stretch), and they are the best jeans I've ever owned. I'll admit now that I haven't washed them even though I've worn them A LOT, but they don't stretch out after multiple wears like most stretchy jeans do. They're fabulous!